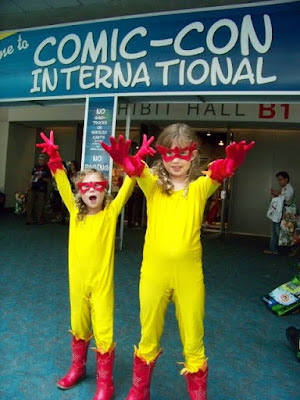 We Love Colors Yellow Kids Unitard helped make these exciting Firestar costumes a complete success at this year's Comic-Con International in San Diego. It was the perfect piece to transform these adorable little girls into fire-making superheroes! Thank you for the wonderful yellow unitards - "Firestar" costumes turned out great!!! !